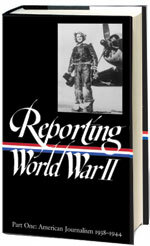 Martha Gellhorn, Ernie Pyle, John Hersey, A. J. Liebling, Edward R. Murrow, many more! Indiana native Ernie Pyle was one of World War II’s most famous reporters, in an era when journalists covering combat were as celebrated as movie stars. 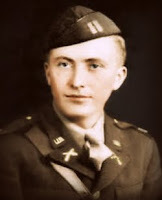 One of his best-known dispatches concerned the death of Captain Henry T. Waskow on December 14, 1943, during the Battle of San Pietro Infine in Italy. The officer was twenty-five years old. Pyle himself would live only sixteen months after the death of the “beloved” Capt. Waskow. On April 18, 1945, the forty-four-year-old journalist was traveling in a Jeep with Colonel Joseph B. Coolidge and other soldiers on Ie Shima, a small island near Okinawa, when a burst of machine-gun fire strafed the procession of vehicles. When the barrage of bullets finally stopped, Pyle asked Coolidge, “Are you all right?” before the sniper fire started up again, killing the reporter instantly. Hours after the tragedy, a “visibly shaken” Coolidge tearfully told a New York Times reporter, "I was so impressed with Pyle's coolness, calmness and his deep interest in enlisted men. They have lost their best friend." The legacy of Capt. Waskow endures seven decades after his death. Lieutenant Bill Walker, the fictional hero played by Robert Mitchum in the 1945 movie The Story of G. I. Joe, was based in part on Waskow (and the death scene in the movie is notably faithful to Pyle’s dispatch). The high school at which Waskow was student council president bears his name. And, most poignantly, Capt. Waskow had written a widely quoted letter intended for his family on the event of his death. The opening and closing passages offer advice for those of us still living. If you get to read this, I will have died in defense of my country and all that it stands for—the most honorable and distinguished death a man can die. It was not because I was willing to die for my country, however—I wanted to live for it—just as any other person wants to do. It is foolish and foolhardy to want to die for one’s country, but to live for it is something else. Try to live a life of service—to help someone where you are or whatever you may be—take it from me; you can get happiness out of that, more than anything in life. AT THE FRONT LINES IN ITALY, Jan. 10 — (by wireless) — In this war I have known a lot of officers who were loved and respected by the soldiers under them. But never have I crossed the trail of any man as beloved as Capt. Henry T. Waskow of Belton, Tex. . . . If you don't see the full story below, click here (PDF) or click here (Google Docs) to read it—free! Excellent account of Captain Waskow, and a sobering reminder of the price paid by hundreds of thousands of American military personnel during WWII. We should never forget and eternally be grateful for their sacrifice for our liberties. Good selection for the solemn occasion of memorial day - a reminder of the individuality of each loss and the personal sacrifice given by each person who, one-by-one and united with others, fights for the values in which that person believes. So sad, multiplied by so many more since then. Even sadder that it is still happening even now. The late Paul Fussell, the author of several books on war and a combat veteran himself, was less enamored of Ernie Pyle, and takes issue with this very article on Capt. Waskow. Fussell's comments can be found on p. 287 of his book "Wartime: Understanding and Behavior in the Second World War." It is viewable on Google Books.